At Baselworld, Bulova released a pair of heritage inspired watches for their Archive collection. 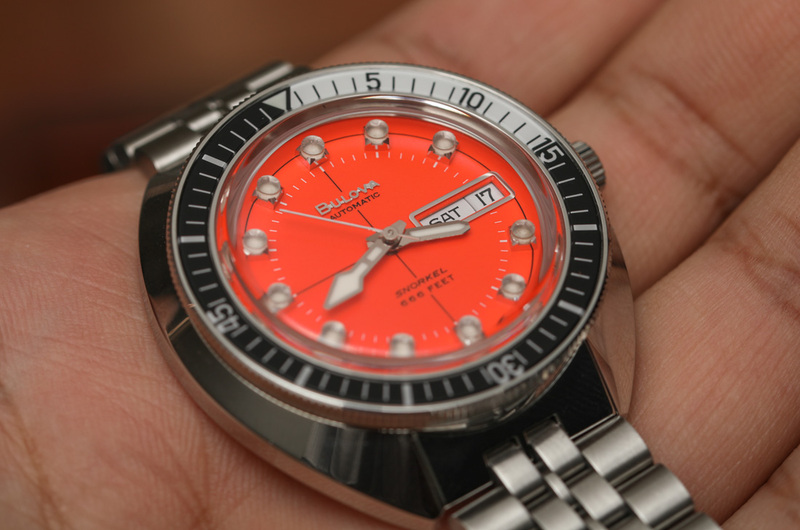 Both are based on the brand’s cushion-cased Oceanographer diver of the 1970s. With a more true-to-the-original and expensive version in the orange dial Bulova Archive Series Oceanographer Devil Diver Limited Edition and a somewhat updated take on the design with the larger, non-limited Archive Series Oceanographer Devil Diver, Bulova have tried to please different kinds of fans with different takes on one of their most loved designs. 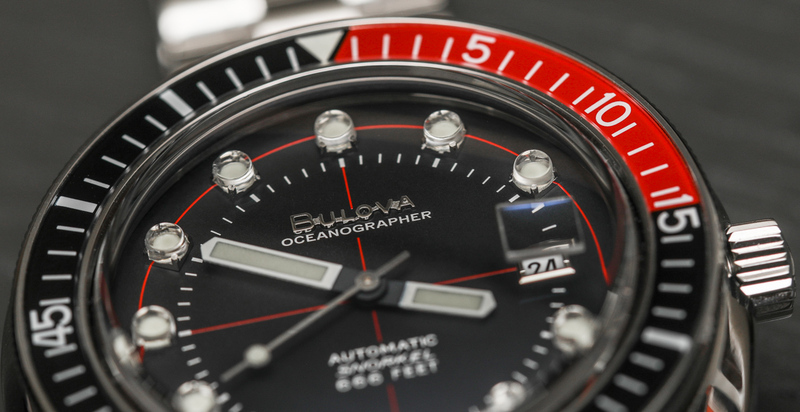 Here, we go hands on with both of the Oceanographer Devil Divers to get a closer look at Bulova’s handiwork. Most central to the Devil Diver’s look is the dial. Both versions feature the large, applied, circular luminous hour markers, sitting just inside of a printed line encircling the dial. The smaller limited edition version has an orange dial, simple minute marker lines printed in white, and an outer ring and central cross hair motif printed in black. 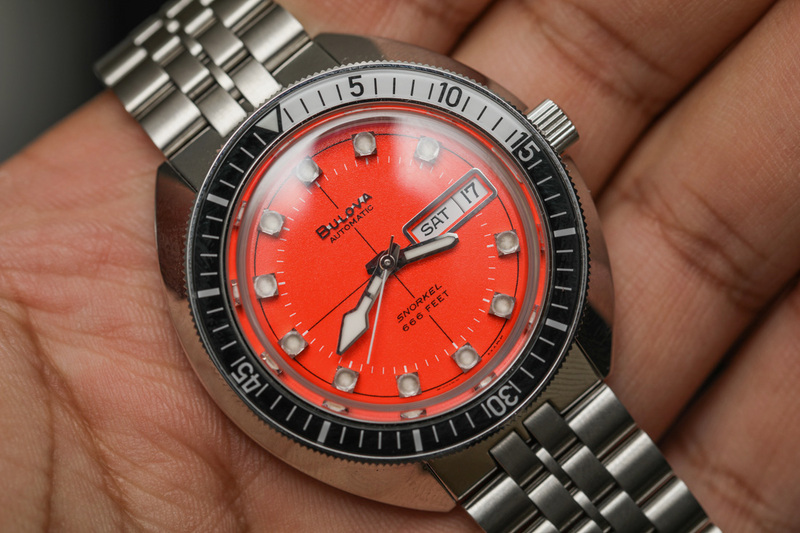 Also true to the original is the dial text, with an applied Bulova signature and “automatic” at twelve and “snorkel” along with “666ft” at 6 o’clock. With a black dial, the non-limited version features red highlights and a wordier dial with “Oceanographer” printed underneath the applied brand signature at twelve. Both watches have date functions located at 3 o’clock, with a day/date function on the limited version and a simple date window on the standard version. Hands are different from one model to the next as well, with quirkier chromed luminous hands on the orange dialed limited model and pared down baton hands on the standard version. Both dials are clean, highly legible, and evocative of the era in which they were designed. Both versions are also very true to their ancestors, with only very subtle changes to differentiate their position on the brand’s timeline. The biggest differences are in the arrangement of text on the larger black dialed version, likely an effort to balance out the dial when presented in a larger version. 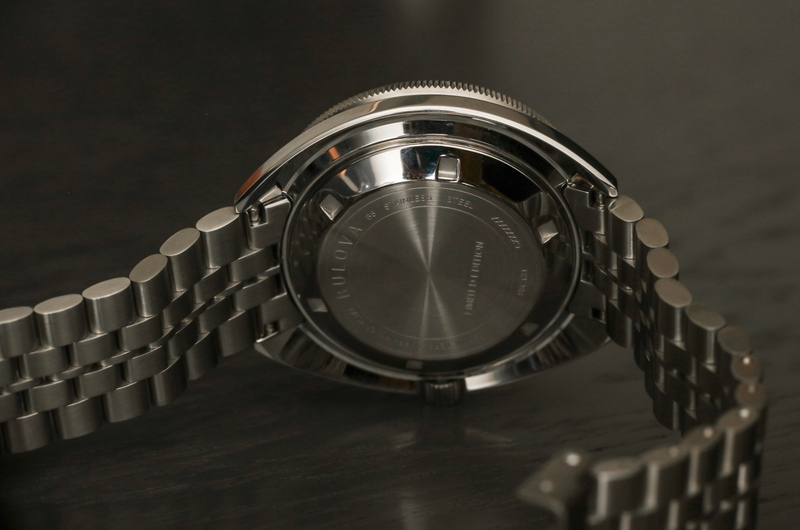 Both watches are, in keeping with their ancestors, housed in stainless steel cushion cases. 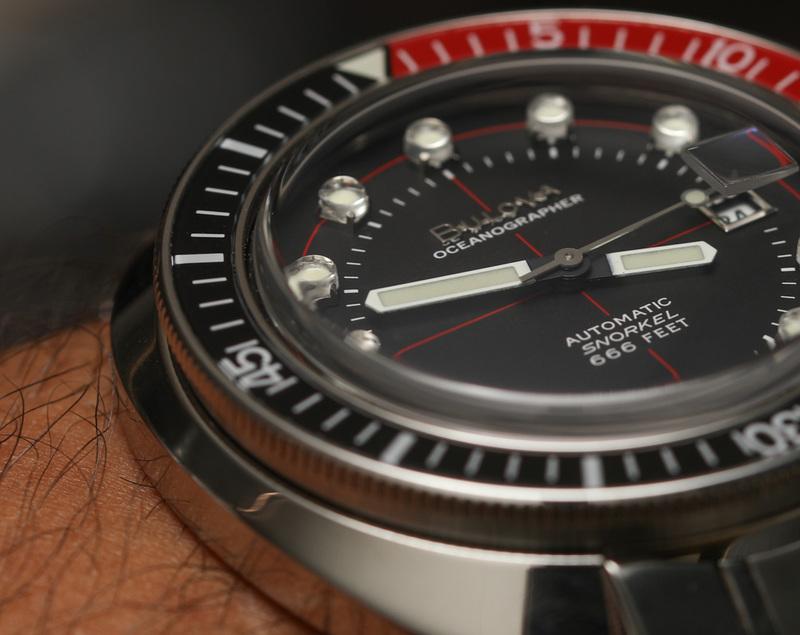 Popular in the 1960s and ’70s, cushion case shapes for watches were prevalent especially in dive watches. Doxa is another brand that utilized the design for their Sub series and still does with their modern collection. The Archive Series Oceanographer Devil Diver models both feature near identical case designs, with the principal difference being size. The limited version is 40mm wide whereas the standard model speaks more to modern tastes with a 44mm case. Both cases are curved to fit the wrist comfortably and feature a screw down crown in the traditional 3 o’clock spot. 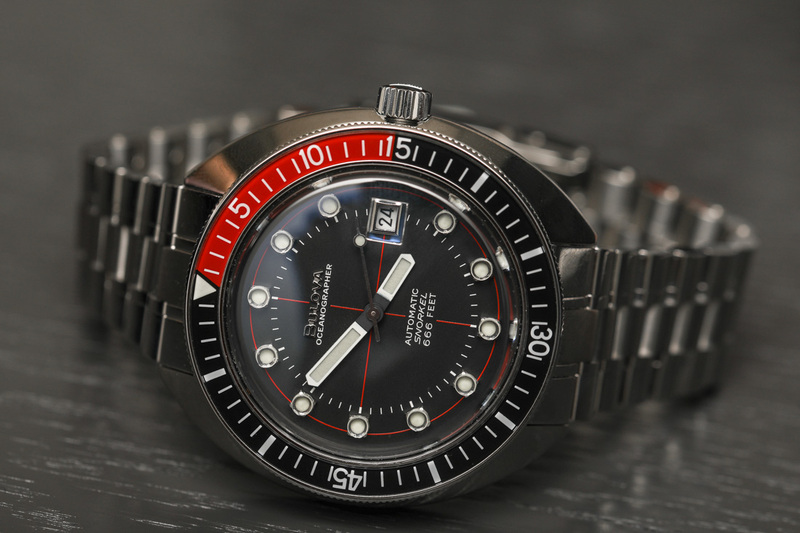 Colorful acrylic bezels, all the rage in the ’70s, are featured on the Devil Divers, with a black and white bezel on the limited example and a color matched black and red bezel on the standard version. Box sapphire anti-reflective crystals and simple screw-down casebacks on both versions complete the 200m water-resistant package and shield the movement within. 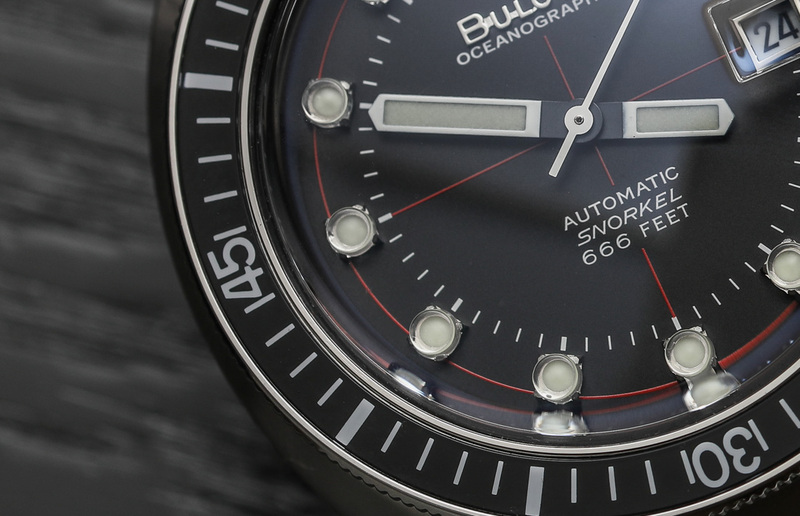 The principle difference between Bulova’s Devil Diver variations other than size is the choice of movement. 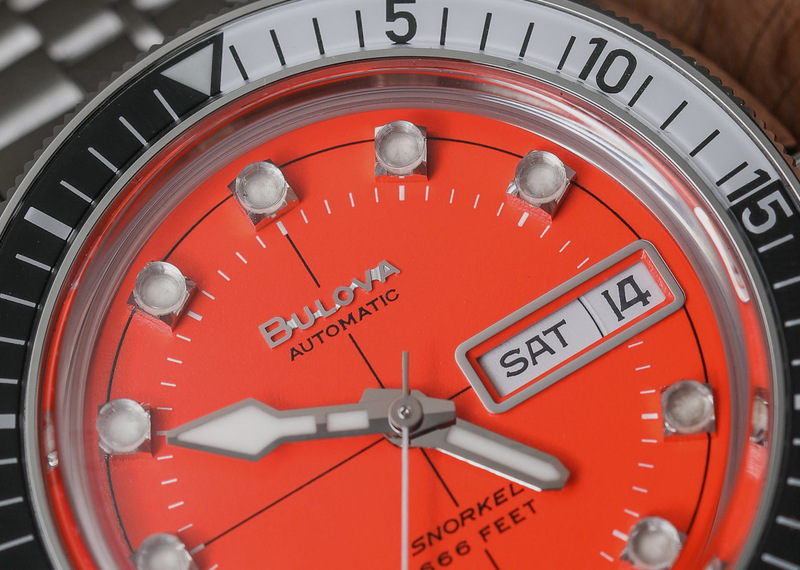 The limited edition (and more expensive) orange dial version houses a Swiss made Sellita SW 220 automatic movement with 26 jewels and a rate of 28,800 vph whereas the standard model utilizes a Miyota automatic caliber. The different movements show how Bulova has positioned the two watches, with a Swiss powered limited edition version for the collectors and a more conservatively appointed version for the masses. Rattly, over-complicated bracelets are another hallmark of dive watches from the 1970s, and the Limited Edition Archive Series Oceanographer Devil Diver takes full advantage of the look and feel of the original in its jubilee bracelet design, whereas the larger and heavier Archive Series Oceanographer Devil Diver has a more updated looking bracelet to match the increased heft. Some vintage diving nerds may be left wanting for a ‘tropic’ rubber variation but with what appear to be 20mm and 22mm lug widths, aftermarket options are plentiful. So called “vintage reissue” or “heritage” watches, which are all over the place, tend to fall into two categories. First, and most often, you’ll see the reimagined take on a brand’s most revered model or models, with old school design DNA alongside modern materials and execution. The Tudor Heritage Black Bay is a good example of this idea. Then, there are the true reissues, almost exactly the same as their forebears in look and feel, albeit subtly updated with tech in keeping with today’s standards. Seiko’s recently released Golden Tuna reissue is a great example. What’s really cool here is that Bulova did both, daring to attempt to please everyone rather than simply turning up their noses at those who think they should have done one or the other. Great review Ben. Nice watch. I rather like these; they have a nice 70s thing going, and the hour markers are just superb – a really nice touch. The orange dialled variant is my favourite – who doesn’t love orange? Shame the bezel isn’t sapphire too, but perhaps that’s to be expected at this price. Sure the very cool hour makers are tall, but even allowing for that, the hands are all too short. And I don’t care for the minute hand on the orange dialed reference. It is easier to tell apart from the hour hand, so that makes it better for diving, but since most will only be used for desk diving, it really doesn’t matter that the minute hand is distinctive. Otherwise, not bad and the prices seem reasonable. I’m not in love with the 70s cushion shaped case, but it more or less works on these watches. And why does the black dialed reference’s second hand have a lumed pip while the orange dialed ref. does not? I don’t believe the original had a pipped seconds hand either. Good eye – I agree the hands are short on the LE and the non LE edition has the better set all around. It’s just a silly phase…. I like them. 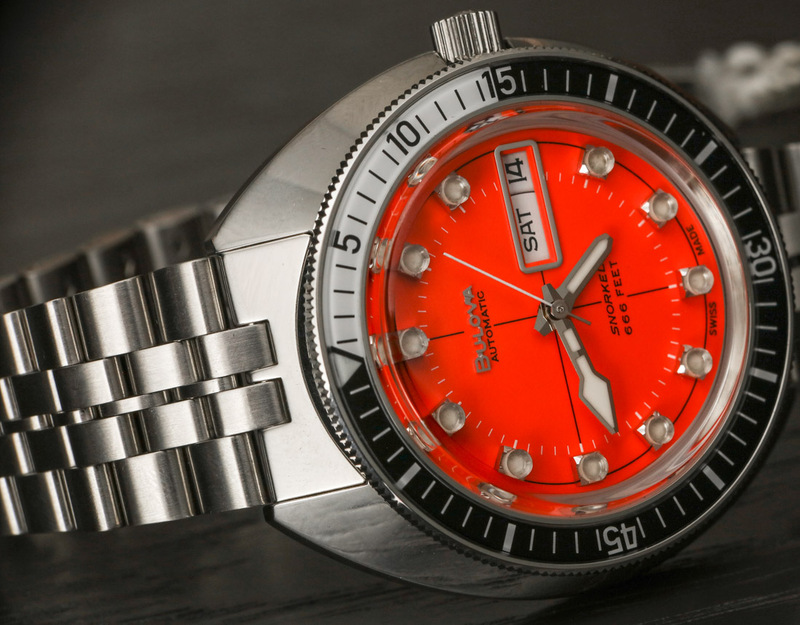 The orange one reminds me of the DOXA SUB 1200T Professional and costs 400$ less than DOXA. 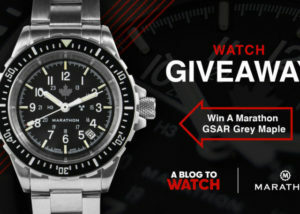 It reminds me of my SKX011J which is $1200 less. I acknowledge there are differences in movement, etc. between this Bulova and the stock Seiko, but I’m not sure $1200 worth of difference. True. But that’s not because Bulova is a poor value, it’s because Seiko offer unbeatable value. I’ve also had a very cheap Seiko Sea Urchin – did all the imaginable activities in it from biking to snorkeling in the ocean. Regret selling it. 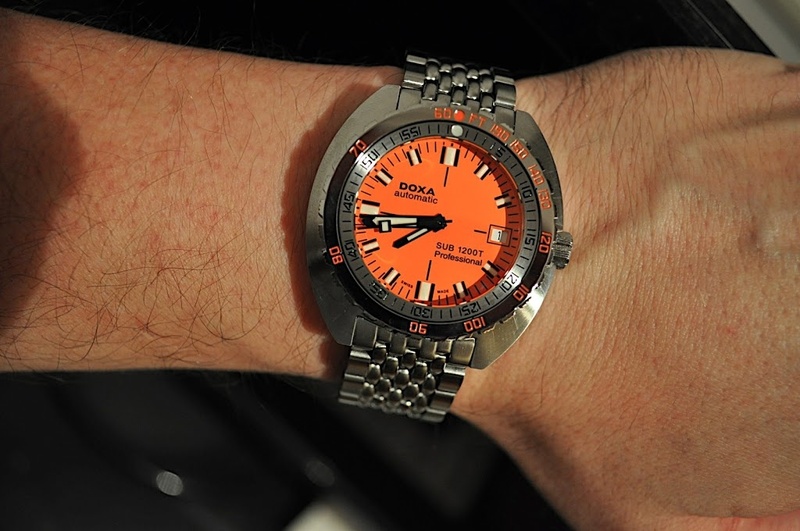 I regret selling my Doxa…a fantastic watch which can be found for less than the Bulova. 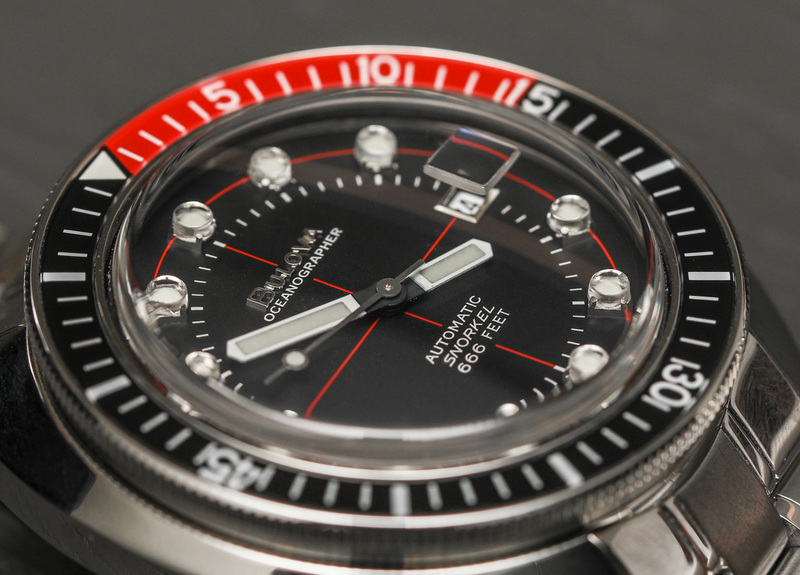 I would opt for the Doxa over the Bulova. Have never seen any Doxa in the wild. Seems like they have limited retail distribution. Yet I’ve always been kinda interested in their divers – for me their looks became kinda iconic on par with other famous dive watches like Submariner, Seiko MM, Blancpain FF, Longines LD, etc. 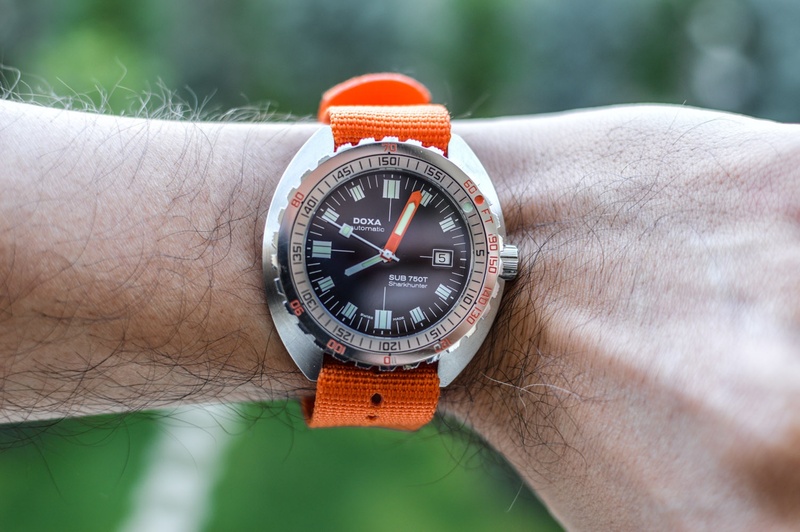 The best thing about the Doxa (apart from the quality) is true exclusivity — you will either see a WIS wearing one, or a true diver. In either case it’s a great conversation starter and a way to recognise someone who knows their watches! Far as I know their retail presence in North America is non-existent. 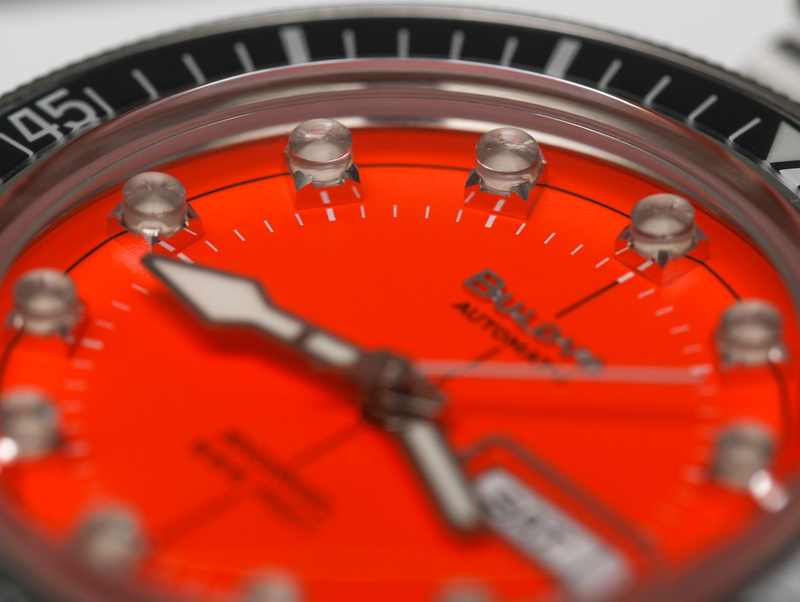 There is no reason to buy Doxa new. You can find them very easily second-hand. Even if you buy new they will not keep their new condition for long. The orange Bulova will be an attractive buy for 600 street price. 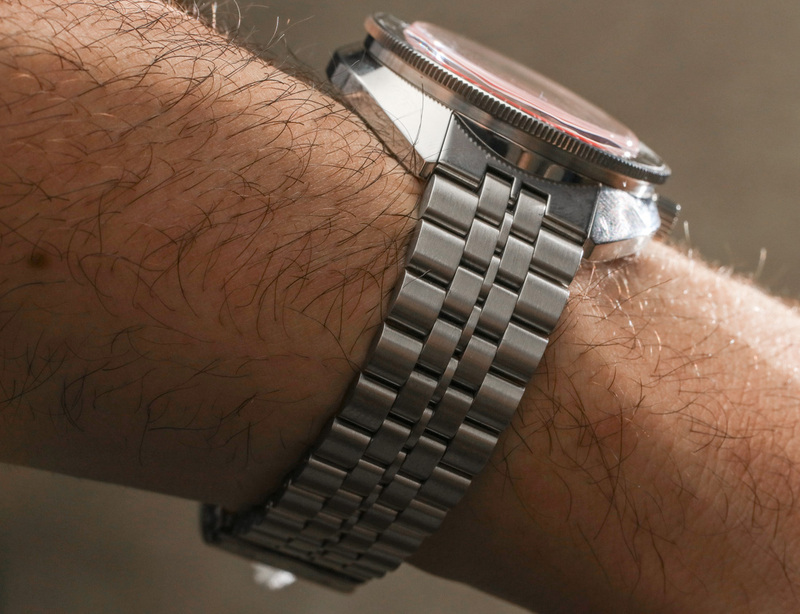 I actually like the Doxa – a lot. It has much better hands IMO, for starters. Beautiful watch! 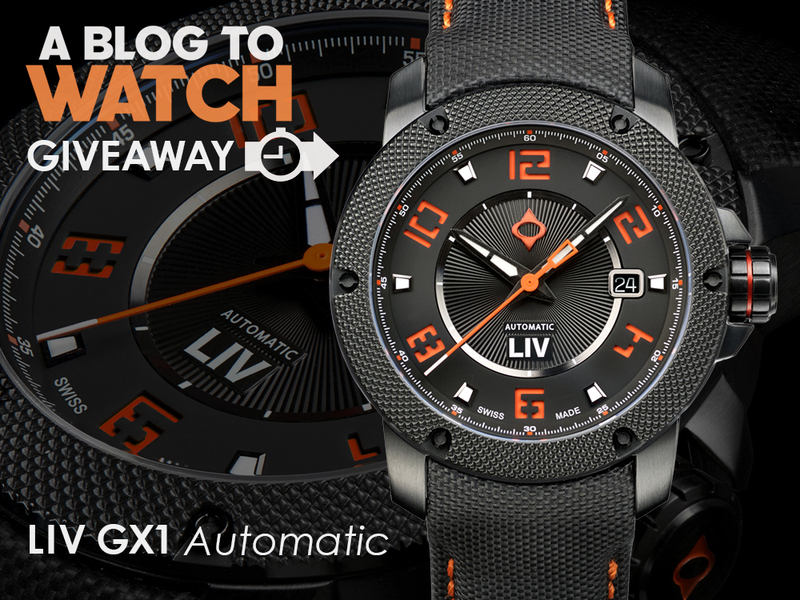 And you matched well the minute hand and the FT markers on the bezel with the orange strap. So the dial crystal is a sapphire but the bezel crystal is acrylic? Boooo. Anyway, cool retro vibe for sure. No need for the non LE to be 44mm, 42 would have been sufficient. Not enough coke bezels going around so nice to see that but again, should be sapphire like the dial. I like the LE version “devil horns” that attach the pips to the dial. Very cool detail in a watch of this price. Fitting for the theme. 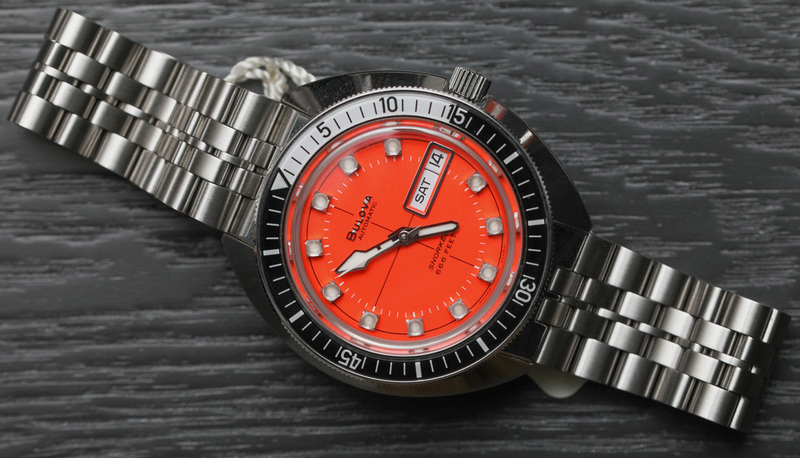 Perfect for the person who likes Doxa, however cannot wear 43mm. The black, non-limited, edition is awesome looking. What a handset! Those hour indices are off-the-chain cool. Gotta love the price too…that’s an honest watch. In this instance i think you’re paying a fair price for what you get. No lume shot of this desk-diver? Other than the hour markers, I like it.